Arsenal holds an enviable record of successive outings in Europe as well as group stage records but all that will come to nothing in the coming weeks. A shambolic home loss to Olympiacos of Greece in the second game of group F in the UEFA Champions League. Arsenal had surprisingly lost at Zagreb a fortnight ago but dislodged Leicester City on Saturday to offer fans some tips of what to expect against the Greek champions. How misleading that was. Olivier Giroud was missing due to suspension but Santi Carzola and Francis Coquelin returned. It was Felipe Pardo who opened the flood gates after getting on the end of a Konstantinos Fortuinos cross just after the half hour mark. Theo Walcott struck just two minutes later but it was the visitors who would have the last laugh in the first half. A sensational error from cup games goalie David Ospina gifted the Greek side the pivotal lead as the Colombian shot stopper dropped the ball in his own net bizarrely. Arsenal began the second half brighter, copping possession but wasteful in the final third. Arsene Wenger hauled of Laurent Koscielny who looked to be struggling and the returning Francis Coquelin. The move paid off as Alexis Sanchez equalized afterwards but hardly had the Arsenal celebrations settled before the visitors restored their lead through Alfred Finnbogason. 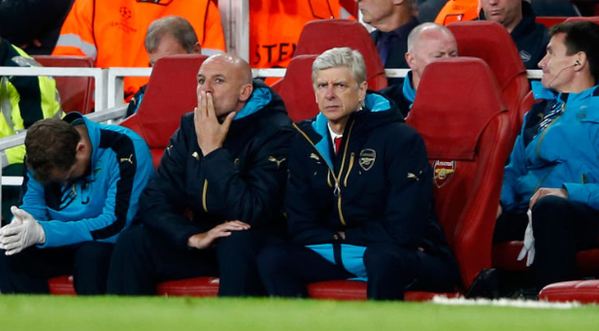 It was a huge blow to concede within a minute of scoring and Arsenal never recovered. Bayern destroyed Dinamo Zagreb in Munich and that meant Arsenal are rock bottom with zero point and must now win all remaining games if they're to have a chance of qualifying including two ties with German champions Bayern Munich.